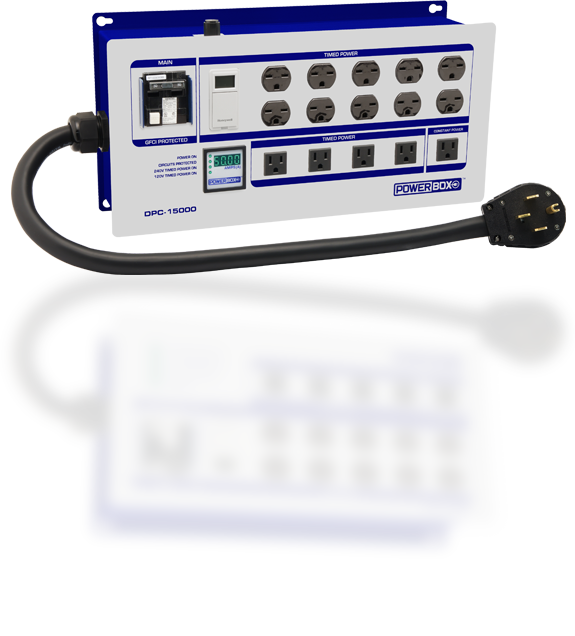 Powerbox® DPC-15000TD - ON SALE! - FREE Shipping! For larger operations running 10 lights, thePowerbox® DPC-15000TD is your top choice. This model has all of the features you need to keep your lights running safely and at peak efficiency, plus you get a special Time Delay feature that extends the life of your bulbs by allowing them to cool down completely prior to restarting, after a power outage. You get the ultimate in protection, thanks to a microprocessor-controlled GFCI main circuit breaker that can sense a wide variety of dangerous conditions on downstream loads and instantaneously de-energize all connected devices, helping to prevent things like fire and electrocution. Plus you get features like a digital ammeter to monitor load usage and a digital timer to control light cycles. Designed and manufactured in California from the best industrial-grade components, the DPC-15000TDis ETL Listed, UL Approved and CAN/CSA Approved. Setup is fast and easy. Plug directly in to a 240-volt range-type outlet (NEMA type 14-50r) to be up-and-running in minutes, or hardwire directly to your panel. Rated for continuous capacity, there are 50 Amp and 60 Amp versions available. There are a total of TEN NEMA type 6-15 240V outlets to power your lights, and 5 NEMA type 5-15 outlets to run your light-duty accessories. A digital timer with battery backup controls light cycles. An optional trigger cord port allows other controllers to override the timer and control the Powerbox® directly. Safe, quick to install, and easy to use. Don't even consider plugging your expensive gear into a cheap controller. Lighting requires more power than anything else in your garden, so when safety and reliability matter, Powerbox® is your only choice. Digital ammeter shows load usage in real time. 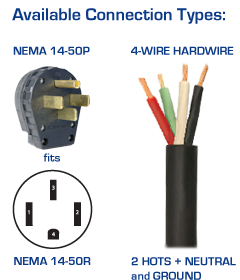 Plug & Play into 4-prong range-type outlet (NEMA 14-50r), or hardwire to panel.